This Memorial Day weekend finds ChumpCar World Series invading Florida's most famous race track while some other race goes on in the Midwest. The 14-hour race runs all day and into the night at Daytona International Speedway. It marks the second year for Chump at Daytona and the 3.81-mile "roval" circuit will host 123 entries, many of whom will undoubtedly leave a wake of debris around the prestigious track. Unlike last year when a squall from Tropical Storm Beryl dumped several inches of rain on the Daytona circuit, weather forecasts indicate that the track should stay nice and dry all weekend. While the layout will use the infield course, a substantial part of the oval will also come into play, meaning that ability to achieve high speeds on the banking and the front straight will likely make the difference. We wouldn't expect a car with a fastest lap slower than about 2:28 to have a chance at winning, but we love when teams to prove us wrong. We think there's only one place to start when previewing this race and that's with last year's winner, BoomPowSurprise's chopped-top Ford Probe GT. The Probe ran a best lap of 2:22.3 last year and finished with a three-lap advantage. The team who built this car might know a thing or two hundred about Daytona; the team is run by Daytona Prototype manufacturer Riley Technologies and they can run a whale of a race. Naturally, it stands to reason that last year's runner-up deserves some consideration, so keep Robin Bank's Tired Iron Repair Saab in your mind as a team to watch. If you've followed crapcan racing for any length of time, you know these Saabs hold together like glue and win races like the Swedish maker knew their quirky machines were destined for crapcan greatness. Look for a strong outing from Flatout Racing in their Nissan 300ZX. That car ran a scorching 2:19.1 at Daytona last year, which was second only to the not-running-this-year Blitzen Benz Mercedes 190E. At Sebring last fall, Flatout had something to prove, thundering to a six-lap victory on the full course and proving they could hold together to make their speed count. If the race comes down to speed, double down on Flatout. Based on sheer numbers, SRI Racing maintains a small advantage. With three well-sorted BMWs on the entry list and a decent track record in recent Chump races, they could be a good team to hedge bets on. Keep an eye on the GFY Motorsports Nissan 300ZX, too. Over several races, they've found the magic formula to keeping a Z car from bursting at the seams while also running a good pace. They'll look to improve on their eight-place finish at Daytona last May. Another Top 10 finisher from Daytona last year, The Shockers, return with their BMW E34. Their 5-Series ran a blistering 2:22.8 last year and could very well be the best-finishing Bimmer this time around, which is saying something in a field with a lot of Bavarian-built beasts. After a frightening high-speed accident in the tropical-storm conditions last year, Jacky Ickx GT30 return with a new and pretty-well-sorted Mitsubishi 3000GT. Their Mitsu ran a solid race at Road Atlanta in February and the team will want to redeem themselves after the heavy knock they took on the banking in 2012. Double Ohh Seven return to Daytona after they proved to have the speed last year but not the reliability to compete. Their Mazda RX-7 could be one to watch and should be the best rotary. As we've written before, we love the ugly sonofabitch look of the Tiger Woods PGA Racing Mercury Cougar and we love its V8 snarl even more. This is the squad's first trek to Daytona, but they won the grueling 25-hour race at Nelson Ledges last year by a wide margin and should be a force to be reckoned with. Look for a couple of well-traveled BMW 3-Series to contend, too: the DTM Special Forces E30 and the Van Winden Racing E36. Van Winden has run six races and finished first or second in five of them. Granted, most of those were in the not-as-well-attended Northern Region, but they've put up solid performances again and again. One last BMW to keep tabs on: the Lowbrow Porsche BMW finished fourth overall at Daytona last year. The brought a decent amount of speed and finished just 42 seconds behind the podium. 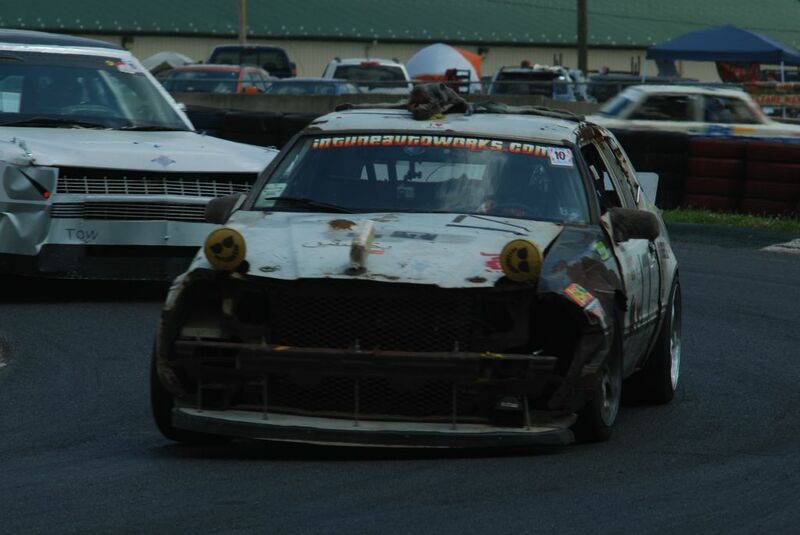 Typical small-block Chevy engines tend to find ways to fail in endurance racing, though their success rates are much higher in ChumpCar than they are in 24 Hours of LeMons competition. One Piece at a Time's Chevy Malibu and Oldsmember's Oldsmobile 98 Regency are both very capable SBC-powered cars that have established solid records of reliability and should have plenty of speed on Daytona's oval. Speaking of American V8s, we would be remiss if we didn't mention the Lead Sled Lincoln, a Town Car that put down a jaw-dropping 2:21.1 at DIS last year, although they were in 41st place at the checkered flag. A few very fast entries will have to prove their reliability can match their lap times: whosyourdaddy.lmao's Volvo 740, Team Mayhem's BMW E36 and Backwoods Racing's Ford Mustang have all had good pace at previous races but have come up short in the standings. Among the best of the four-cylinder cars are the Catch Me If You Can Acura Integra and the Lil' Chump Change Mazda Miata, which actually finished 10th at Daytona last year. These smaller-displacement cars are at a disadvantage at Daytona, but they could manage solid finishes. Team Infiniti are a veteran enough team with their Infiniti J30 to run a solid race. They were a tad slow at Daytona last year, but a well-run race could give them a shot at the sharp end of the field. Keep an eye on two more BMW 3-Series: AC Schnitzel's E30 and Bimmerline's E36. For one reason or another, we see another group of teams as outside contenders: John Allen Special (BMW E30), Track Rat Motorsports (BMW E30), TAJ Racing (Ford Mustang), Maximum Oversteer (Acura Integra), Looney Tunes (Ford Mustang), Schultz N Co. (BMW E36), TFE/Top Fool Elemonator (BMW E36) and Hong Norrth Trons Am/Hong Norrth Sumbich (both Mazda MX-3s). Who do you like in this very large and very deep field? There are some 80 more entries in the field and, as you may or may not know, anything and everything can happen in crapcan racing.